The United States larges Aircraft manufacturer is counting on the 737 MAX, the newest version of the world’s most popular jetliner, to help capture a share of a $2 trillion market over the next 20 years. The announcement of the new aircraft has been expected ever since American Airlines said last month that it would order 100 of the new airplanes, with options for 60 more, pending final airplane configuration and approval of the program by the Boeing board of directors. 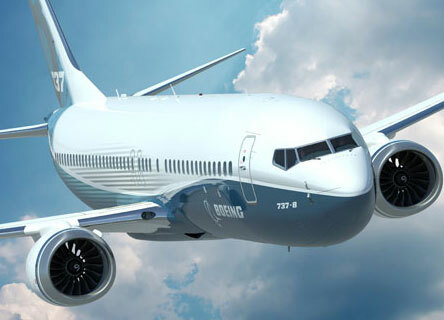 Powered by more efficient engines, the 737 MAX has already won 496 order commitments in “a very positive indicator of demand for what has been viewed as a ‘me-too’ offering,” Robert Spingarn, a New York-based Credit Suisse analyst, said yesterday in a note to clients. The new 737 family will be powered by CFM International LEAP-1B engines optimized for the 737. Boeing said the aircraft has a 7% operating cost advantage over the Airbus A320NEO and a fuel burn that is 4% less, as well as a fuel burn 16% less than the existing A320. Sales and production of the current 737 should run “well into the end of this decade,” Albaugh said. Delta Air Lines Inc. last week ordered 100 737-900ERs, boosting a backlog that was already more than 2,100 planes. Deliveries of the 737 MAX should begin in 2017, two years after Airbus’s upgraded A320neo, Boeing said yesterday after its board gave formal approval to the jet. The commitments are spread among five different customers, the company said.